I’m a visual girl; I’ll tell you directions by the shape of the road and the colour of a building. I’ll remember your face forever even though I’ll forget your name after five minutes. I can stare for hours at a photo but have a hard time explaining why. And this is one of the reasons why I love the web – so much beautiful things to see if you know where to look. A lot of the images I’ve fallen in-love with on the web I’ve bought for a couple of reasons; to support the artist, to encourage art, to beautify my home and sometimes just to own the image even if I do nothing more than tuck it away in a favourite image box. Perhaps it seems easier and cheaper to buy ready made art from mass retaillers but thanks to the web, buying personalised art straight from artists has never been so easy. There’s a value to buying art this way that goes far beyond just the cost. There’s a hard rule in my home; all wall art must either be from me or an artist that I connect with. This makes the process of looking for art fun, personal, creative and meaningful. It’s not too expensive, either – the image above can be yours for as little as $8 and like your food, you know where it came from. Jennifer Causey’s photographs have inspired me for so long and I’m constantly in awe of the stories she tells through her lens. 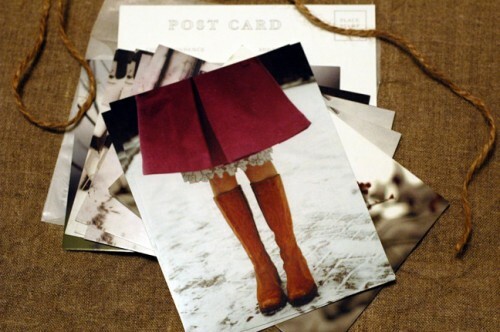 I’ve purchased a photo from her but might have to also purchase the postcard pictured above – I have just the place for it. A Walk Through Durham Township has become a fast favourite when I found it this summer. Almost every photo makes me literally gasp. I often find them haunting in a beautiful way and I think some of my favourite photos ever come from this site. Although she’s not a photographer per say, my friend Alicia’s photos always inspire me with home ideas. When I slept in her pink spare bedroom years ago I understood what having a home was and wanted the same feeling in my own place. We have different aesthetics but hers charm me and give me ideas – and everyone else. She’s currently just selling postcards but she does sell a lot of products that give your home a visual kick, too. And her home has been featured in so many magazines and from her photo’s, you’ll see why (and Stephanie of Little Birds has the same effect on me with her home photography which she does not sell but she also sells goods). Kaat is another one of my favourites – especially with her nature photography. And Lorissa Shepstone makes beautiful websites and beautiful photographs. I always say I want a pony but I didn’t actually mean it until I saw this photo of hers. As for prints, Camilla Engman and Katherine Dunn are both favourites as is Lori Joy Smith who makes whimsical monsters! All offer great, affordable prints as well as one of a kind paintings and objects. Oh there’s more and I’ll have to find some more moments to share them. I just got caught up again when I was going through the links just now and find myself brought to action in my own way. I recently purchased the new book Visual Chronicles because I wanted to see if there was a way that I could combine the visual element to my journals and work; I’ve never been able to mix writing and images before. I’m not a personal journaller and often intimidated by these kinds of books because I never seem to make them as beautiful or interesting as I can see it in my head. But this book is also a visual treat that I think might be the help I need. Well, that and a continuous supply of lovely via the web.